THE launch event of an exhibition to mark the 90th birthday of His Eminence Archbishop Gregorios gave opportunities for sharing and fellowship between the Greek Orthodox Archbishop of Thyateira and Great Britain, more than 100 members of the Greek Orthodox community and staff and officers from International Headquarters (IHQ). 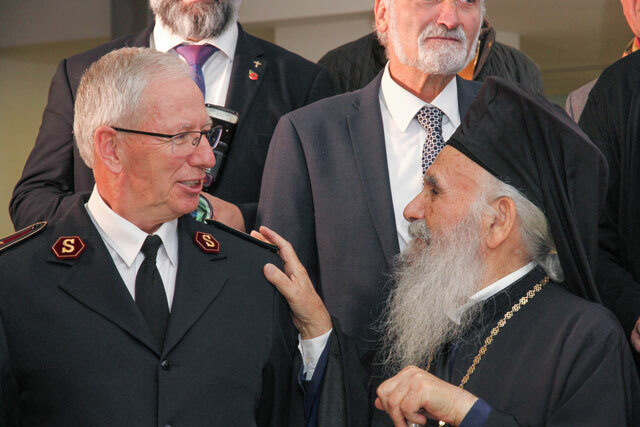 Words of welcome were given by General Brian Peddle, who acknowledged the archbishop’s 30 years as head of the Greek Orthodox Church in Great Britain, Ireland, the Isle of Man and the Channel Islands. Originally from the village of Marathovounos in Cyprus, Archbishop Gregorios moved to the UK in 1959, when he was appointed to the Church of All Saints in Camden, London. In December 1970 he was consecrated as Bishop of Tropaeou (based in north London). Last year he became the longest-serving Archbishop of Thyateira and Great Britain, having been elected to the role in April 1988. Introducing Archbishop Gregorios, the General said how pleased he was to ‘welcome new friends into this place’. The archbishop responded with words of thanks, recognising that Salvationists are ‘our brothers and sisters … united in the person of our Lord Jesus Christ’. Having thanked the artists for using their talents, the archbishop again paid tribute to Salvationists, who he described as ‘soldiers of everyday life – not to kill others but to heal others’. The Immortalised by Art exhibition, hosted by Gallery 101 at The Salvation Army’s International Headquarters in London, brings together both traditional and modern aspects of art that embrace mysterious and Byzantine influences. The works in the show, by eight artists, include the use of glass, printmaking, photography, acrylic, charcoal, ink and watercolour. The gallery space at IHQ, next to the public cafe, is often used to show The Salvation Army’s ministry in a visually interesting way. It also offers the opportunity to work with artists and groups to form connections with and through The Salvation Army, making the most of IHQ’s prime location between St Paul’s Cathedral and the Tate Modern Gallery. Immortalised by Art can be viewed from 8am to 4pm, Monday to Friday, until 6 November.